A taxi driver who refused to take a blind man's guide dog on a pre-booked journey has been fined £300. Zaheer Mahmood, 48, had been booked to collect a man named Mr Bowers from Wellington railway station in Shropshire, the local council said. Mr Bowers' partner, Mrs Bright, said she had told the private hire firm the couple would have a guide dog. Mahmood, of Apley, had denied breaching the Equality Act 2010 but was found guilty at Telford Magistrates' Court. According to the council, Mrs Bright had booked a vehicle for two adults, a guide dog and two large cases on 4 January. But, upon seeing the animal, Mahmood refused to take the fare, saying "no dogs, no dogs", the authority said. Mrs Bright was forced to contact the operator and wait for a second car to be sent. Mahmood pleaded not guilty, stating in his defence he had purchased two part-worn tyres that were in the boot, leaving no room for luggage. He claimed he rang the operator and told them of the tyres being in his boot and requested a larger vehicle be sent to the woman. But officers obtained a recording of a phone call made by Mahmood during which there was no mention of the tyres or a larger vehicle, the council said. He was also ordered to pay a £30 victim surcharge and prosecution costs of £2,000. 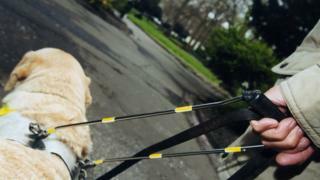 Trading standards manager Frances Darling said it was a criminal offence for a private hire driver "to refuse to take an assistance dog unless the driver has a medical exemption issued by the council's licensing team".